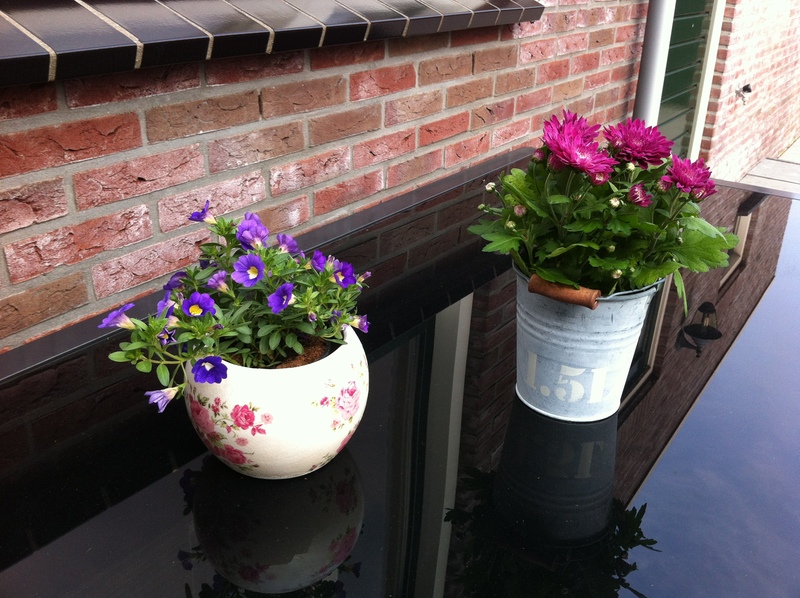 In the village I live people seem to obsess about 3 things – cleanliness, windows decor and flowers. Everyone here has lots of flowers in their gardens. And because their gardens are open (facing the street, no doors), the flowers are for everyone to enjoy (as well as clean front terraces, windows and window decor). I definitely don’t like cut flowers because I think it’s a waste. We kill a living creature and decorate our house with its body until it decomposes. Nothing romantic or nice about this. Living plants are a different thing, however they also die, before us, and this deterred me from having them for a while (also I am horrible at watering them regularly and so they die even faster 😦 ). But having lived here for a couple of months – and read about ongoing demise of bees, poor things – I gave in. I accepted the short lived nature of living flowers. I accepted that they will die after a year and I will need to plant new ones. And so I got two. They are now sitting opposite my living room door and cheer me up whenever I look at them. Ah, the power of flowers (or any other live being) to give us happiness! This entry was posted in default and tagged dutch, flowers, happiness, happy, nomad. Bookmark the permalink.